Immunotherapy is a relatively new and exciting type of cancer treatment that activates the body’s immune system to help identify and fight cancer cells. New studies have shown that a combination of immunotherapy and chemotherapy greatly improves lung cancer recovery rates, leading researchers to believe that immunotherapy could have a larger role in the future of cancer treatment. But what do people think of new treatments like immunotherapy and what is this type of treatment really like? We decided to pose these questions to those in our community who are living with cancer and found that there is a large difference between the perceptions of those who have undergone this treatment and those who have not. We’d like to share the results of this poll with you, but before we get started we’d like to remind you that everyone’s medical situation is different and we do not mean to prescribe one cancer treatment over another. You should always speak with your doctor about what treatment might be right for your situation. First, we wanted to better understand which cancer treatments our community consider to be effective and how the perceived efficacy of immunotherapy compares to other treatment options. Does everyone know about immunotherapy and consider it a “breakthrough” cancer treatment? Opinions were widespread regarding the effectiveness of cancer treatment options. 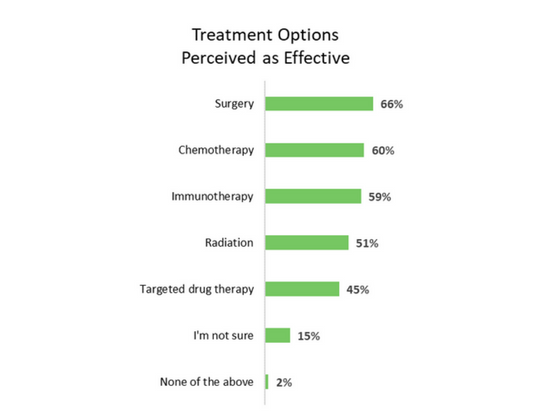 Surgery is the treatment method most often described as effective (66%), followed by chemotherapy (60%), then immunotherapy (59%), radiation (51%) and targeted drug therapy (45%). Those in our community did not consider immunotherapy to be much more effective than other treatment options. Do you think immunotherapy is an effective treatment option? As we dug a bit deeper, we noticed that the opinions of those with immunotherapy experience were much different than those who have not undergone the treatment. 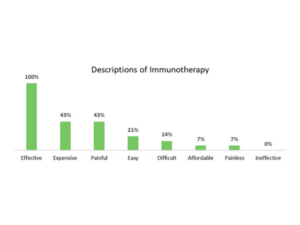 79% of those who have undergone immunotherapy in our community report that the side effects are manageable, while only 26% of those who haven’t undergone immunotherapy think that the side effects of immunotherapy are manageable. Similarly, 93% of those who have undergone immunotherapy in our community consider immunotherapy treatment to be effective and only 46% of those who have not undergone immunotherapy think that the treatment is effective. Our research suggests that outside perceptions of immunotherapy are more pessimistic about the treatment than those who have experienced it themselves. 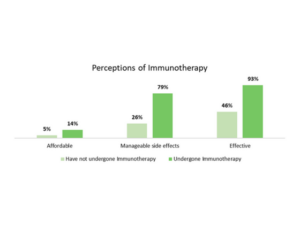 Most respondents who have undergone immunotherapy treatment believe the treatment has manageable side effects and is effective, but those who haven’t undergone immunotherapy have a much less positive opinion of the treatment. 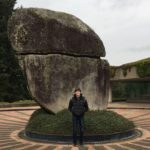 Why do you think those who have not undergone immunotherapy treatment might be skeptical? Next, we wanted to get a sense of how people who have undergone immunotherapy describe the treatment. Remember, cancer treatment is different for everyone and most people experience a long, expensive, and difficult challenge. However, we wanted to see which descriptors ranked highest for those who underwent this treatment. Surprisingly, 100% of respondents described immunotherapy as “effective”. 43% also describe it as “expensive” and “painful”, meaning that they find the treatment effective, but that it does not come without a financial and physical burden. 100% of our respondents describe immunotherapy as “effective” – which may make you wonder why hasn’t it become a more common form of cancer treatment. Unfortunately, as of today, very few immunotherapies have been approved for cancer treatment, meaning that the only way to advance research and treatment options for those living with cancer is by participating in clinical trials. 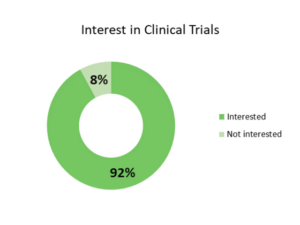 Many living with cancer are unaware of the opportunities available to them, as “only 3% to 6% of cancer patients who are eligible for clinical trials participate”. By not participating in available clinical trials, those living with cancer may be missing out on potentially effective treatments and an opportunity to progress research of future cancer treatments. Given our research and the research of many in the field of oncology, immunotherapy is a treatment option that should be further explored. As seen below, our community is very willing to be a part of progressing cancer research! Would you consider participating in a clinical trial? Whether you have been diagnosed or not, many people are affected by cancer, and we can all do something to help. Join our community to find and give support to others living with cancer and other illnesses.